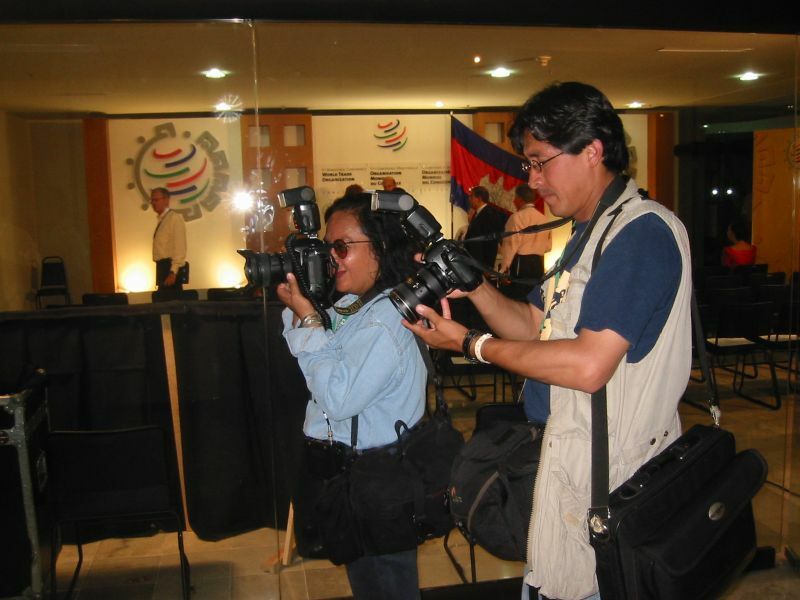 Last week, thousands of trade negotiators from around the world came to Cancun, Mexico for the 5th Ministerial Conference of the World Trade Organization (WTO). 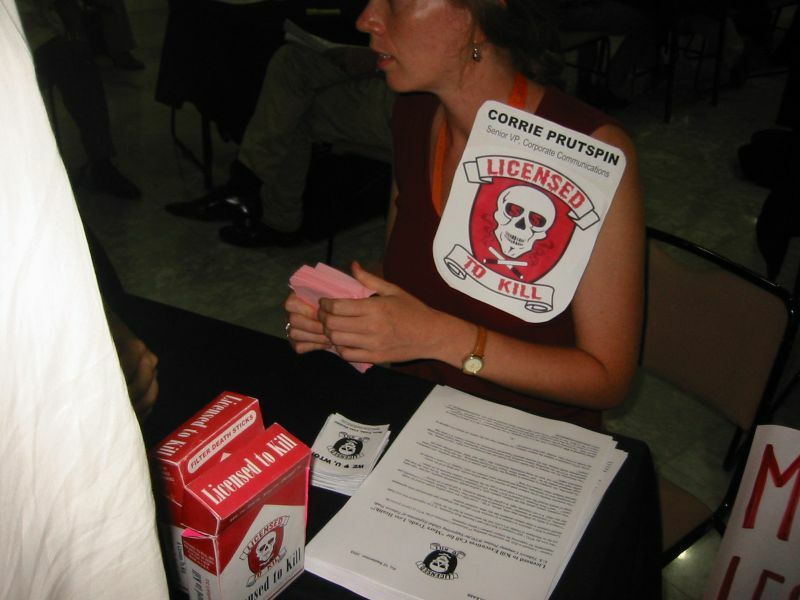 Philip Morris was there, and so was Licensed to Kill, Inc! 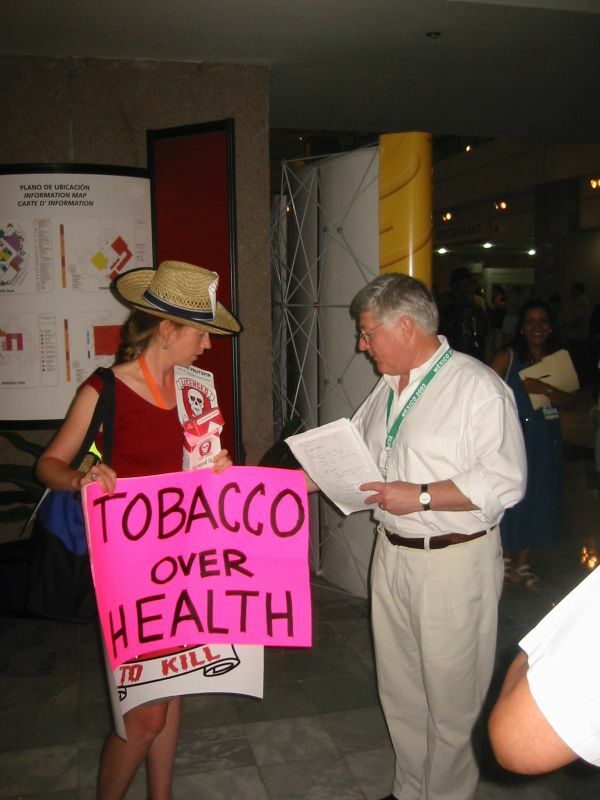 While the trade negotiations ultimately collapsed, Licensed to Kill made the most of the opportunity to lobby WTO delegates face-to-face to protect the tobacco industry from public health advocates. 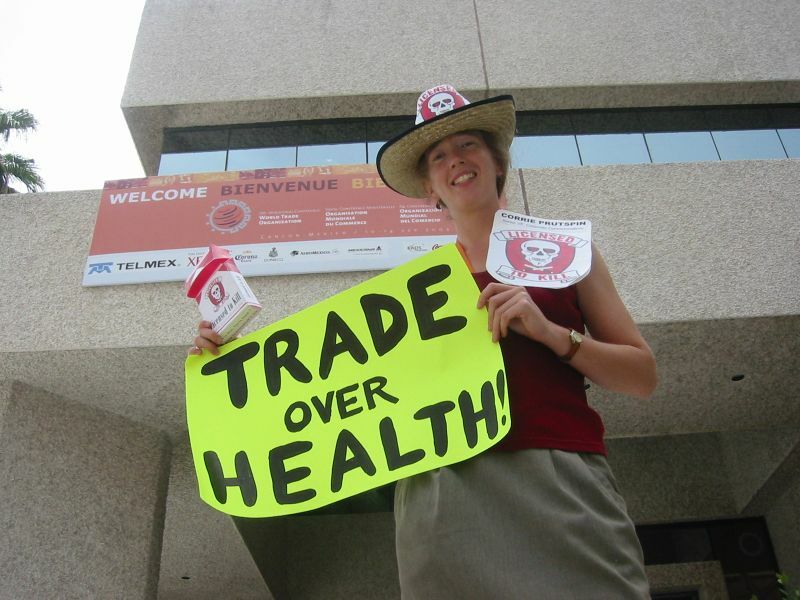 Our message: More Trade, Less Health! A security person soon showed up and asked what we were doing. 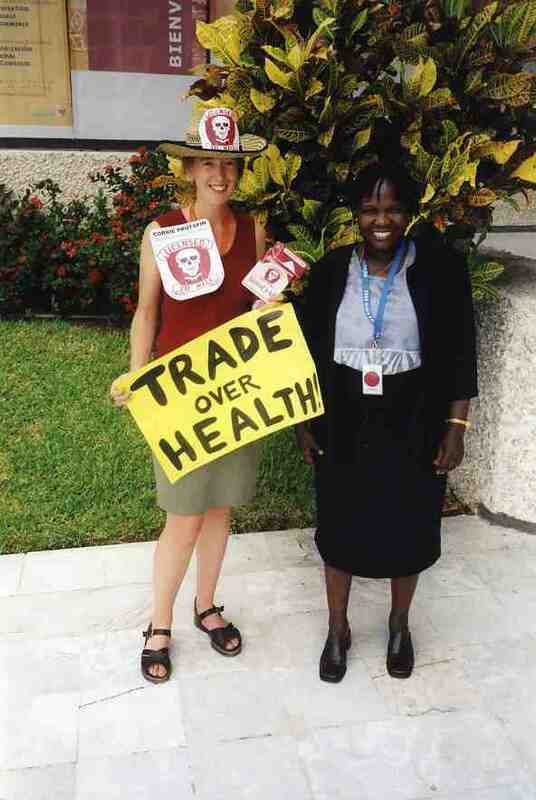 We explained what our company is about and assured him that we were not protesting -- that our company wholeheartedly supports the WTO's objectives of liberalizing worldwide trade, even at the expense of public health. 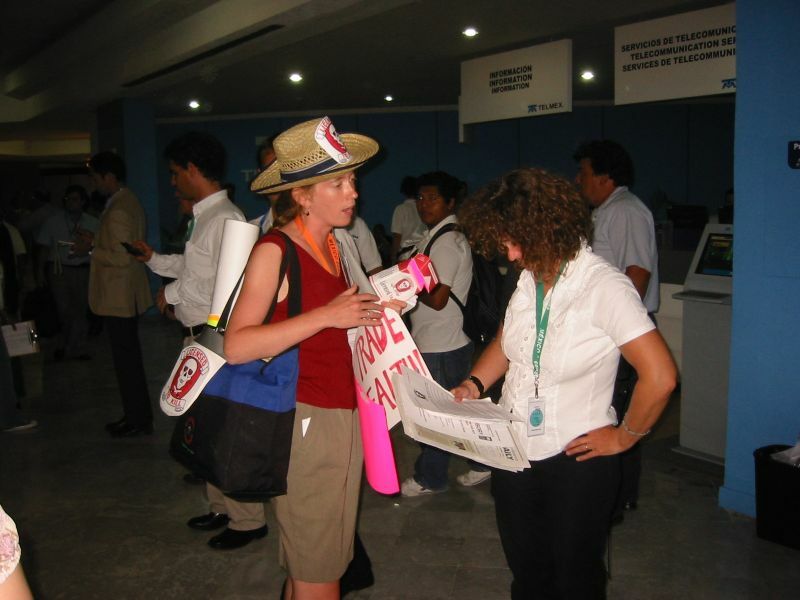 Non-Governmental Organization (NGO) Center. 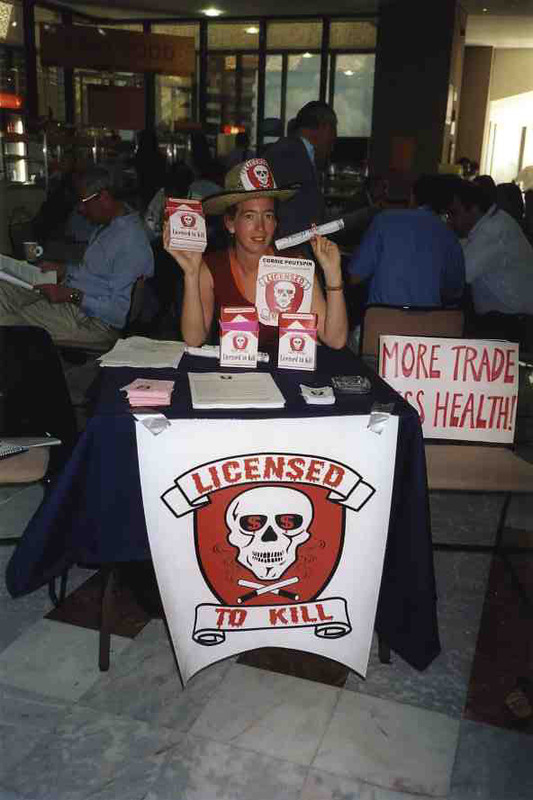 When we clarified that Licensed to Kill is a corporation, not an NGO, we were informed that the WTO classifies corporations as NGOs. 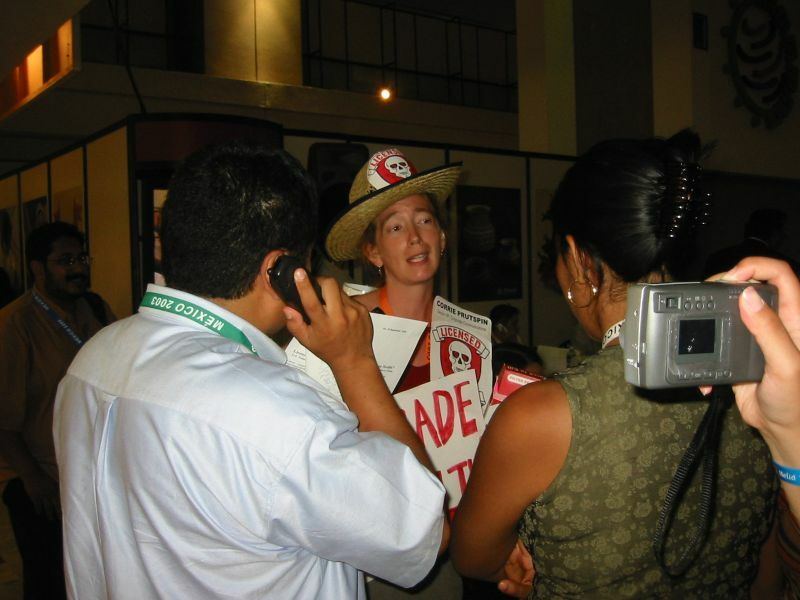 She then invited us to tape an interview with WTO television -- a great way, she said, to get our message across to WTO delegates. opted to go downstairs to the main floor of the WTO convention center. 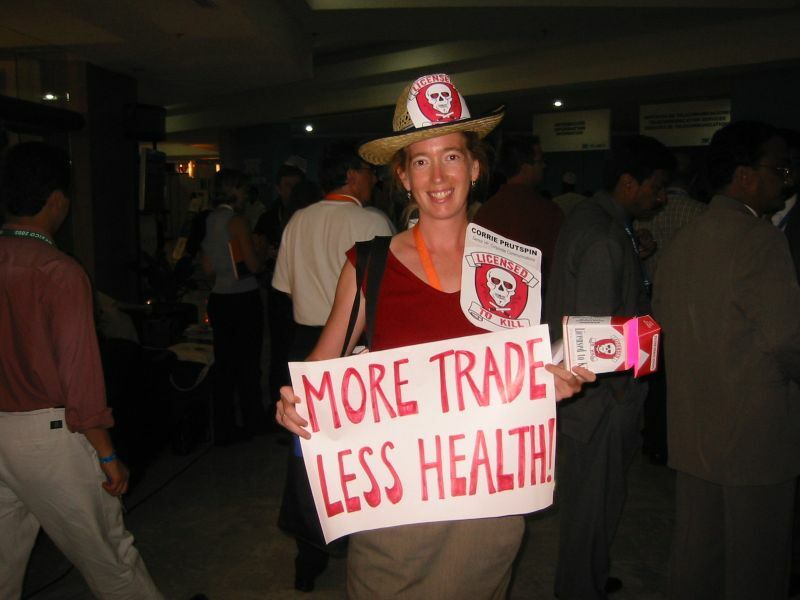 Filled with a sea of WTO delegates and journalists, it was an ideal place to get our message of "More Trade, Less Health!" across. We ran into a delegate from Canada, who told us he was very close to the Canadian trade minister. "You're from Canada? Boy, does our company need to talk to you! 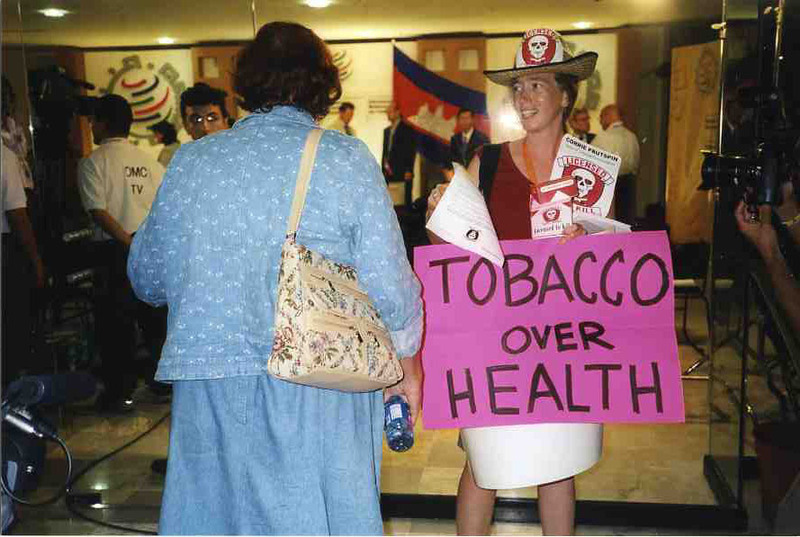 What's up with all the anti-tobacco industry legislation you've been passing recently? 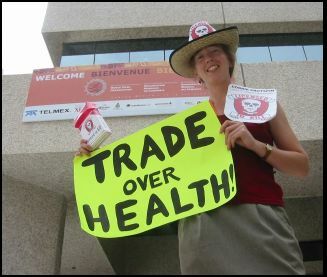 It's because of countries like yours that companies like ours are forced to market all the more aggressively in low-income countries," we scolded, "Perhaps you can pass on a few words to the trade minister?" 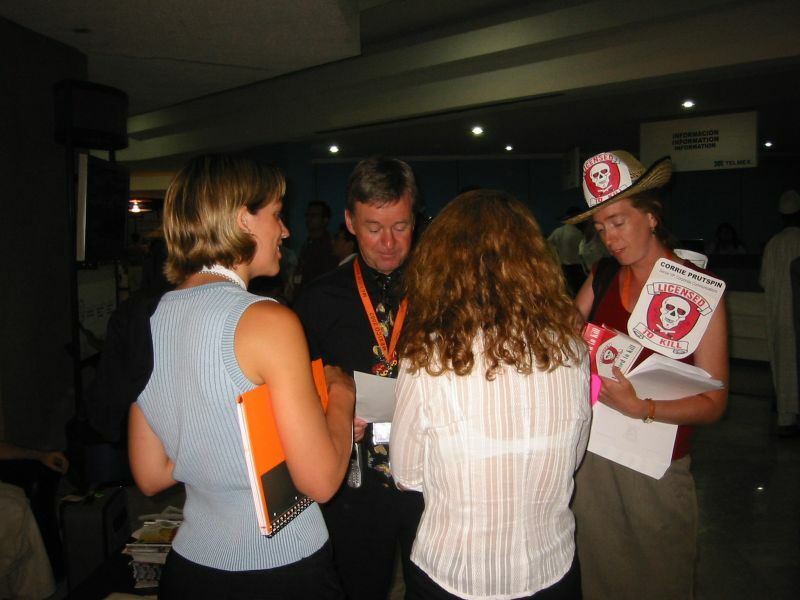 The delegate agreed, so we suggested that his government reconsider a ban on tobacco industry sponsorship of Formula One -- as our company plans to sponsor an F1 team in the near future, in an effort to boost appeal for our "Global Massacre" cigarette brand among youth worldwide. We then entered into a philosophical discussion with a delegate from Europe who took issue with our company's interest in targeting children. "Adults, okay," he said, "but there should be some limits on marketing to kids." Whatever?! We've never understood the "children are sacred, but adults are not" point of view (though our competitors have certainly used it to their advantage). Our company views all life, young and old, the same: as profit-delivery systems. Kids are merely future adults, so why not start branding them early? It's called "cradle to grave" marketing! 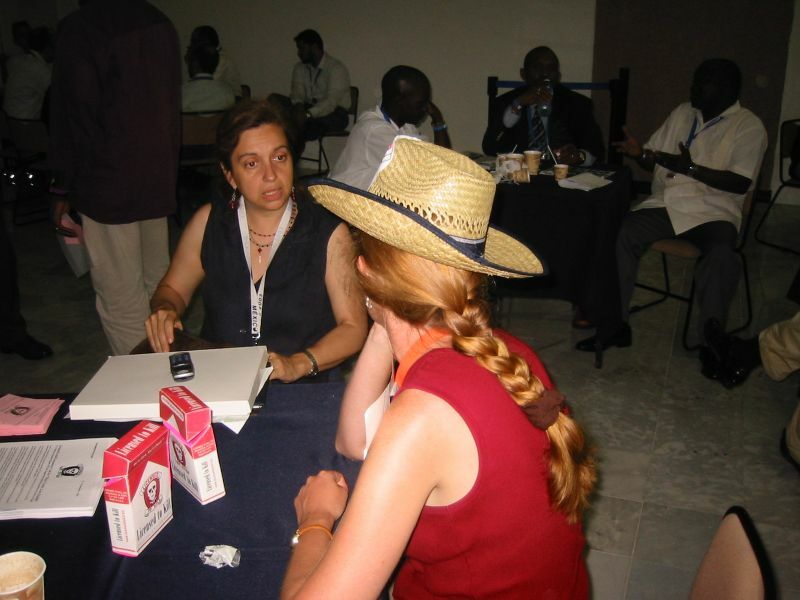 In the restaurant area, we came upon a table of delegates for the United Arab Emirates. 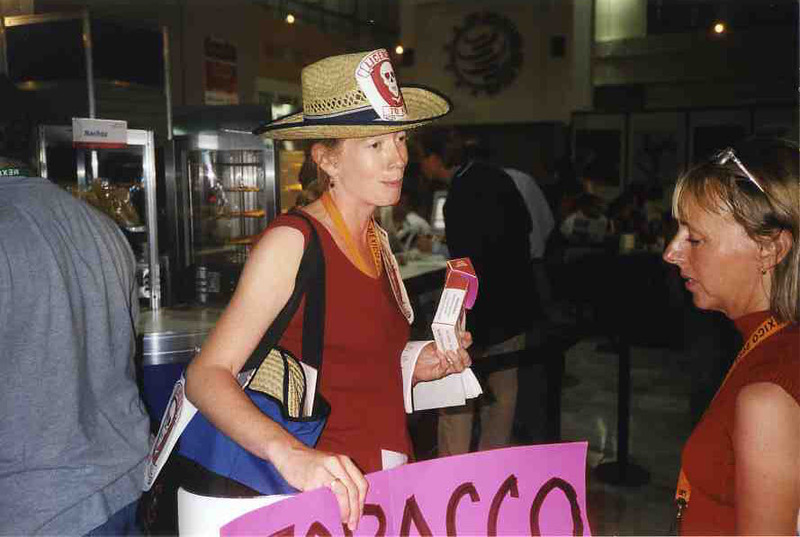 "It is a pleasure to meet you," we gushed, "We are very interested in expanding our sales in the Middle East, especially among women -- as we hear that smoking rates are exceedingly low among them." The delegates shook their heads in disapproval. "But why not? As we understand it, the Koran forbids alcohol, but not tobacco," we countered, conveniently failing to acknowledge that many Muslim scholars do consider tobacco use "haram". Soon after, we happened upon a table of delegates from Gabon to whom we stated our position that "le commerce est beaucoup plus important que la sante." We were a bit taken aback when they vigorously disagreed. 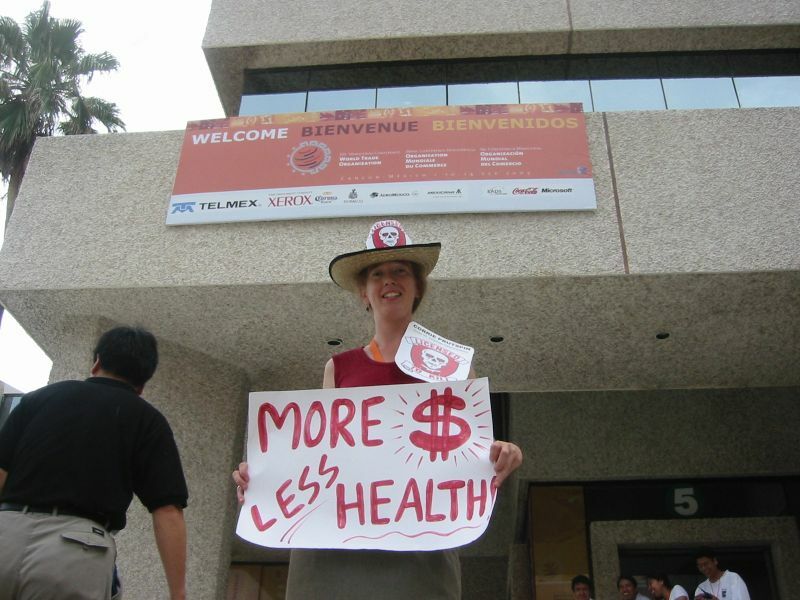 Later we went to the Convention Center entrance and lobbied delegates as they arrived and exited. We were pleased to run into a delegate from Uganda, one of the countries in which Licensed to Kill is particularly interested in expanding its sales. 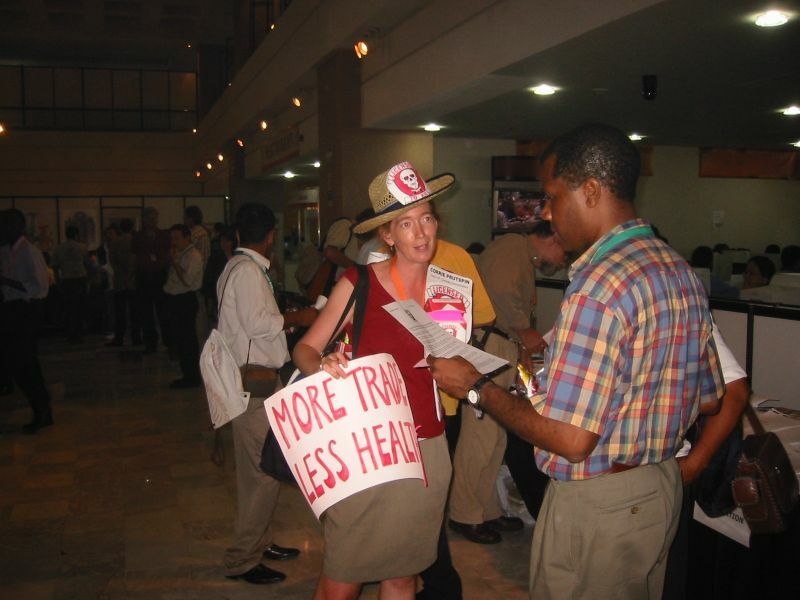 WTO Delegates were later overheard in the restroom reading our press release and saying that the company was "really going over the top." Funny how the truth rubs people the wrong way sometimes. Newsday reporter asked. "Oh, that's right -- you're a corporation," she answered. 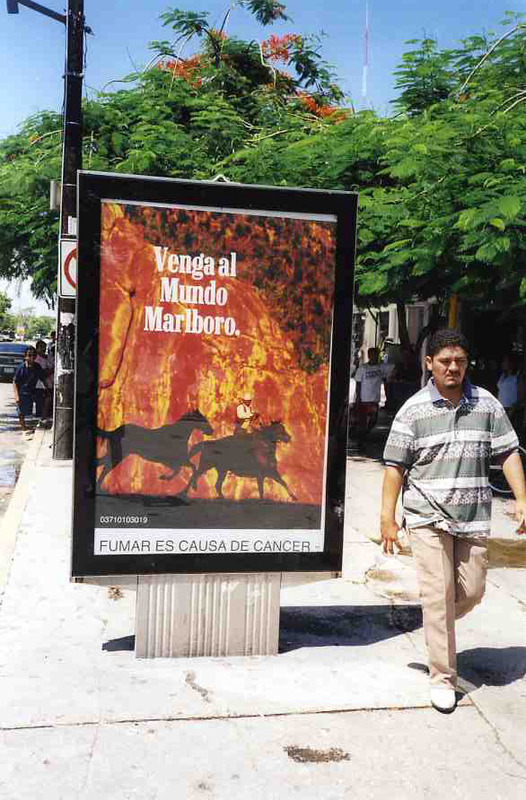 One journalist told us that he had run into some Philip Morris lobbyists the evening before, but they had refused to answer any questions. Hmmm, do they have something to hide? 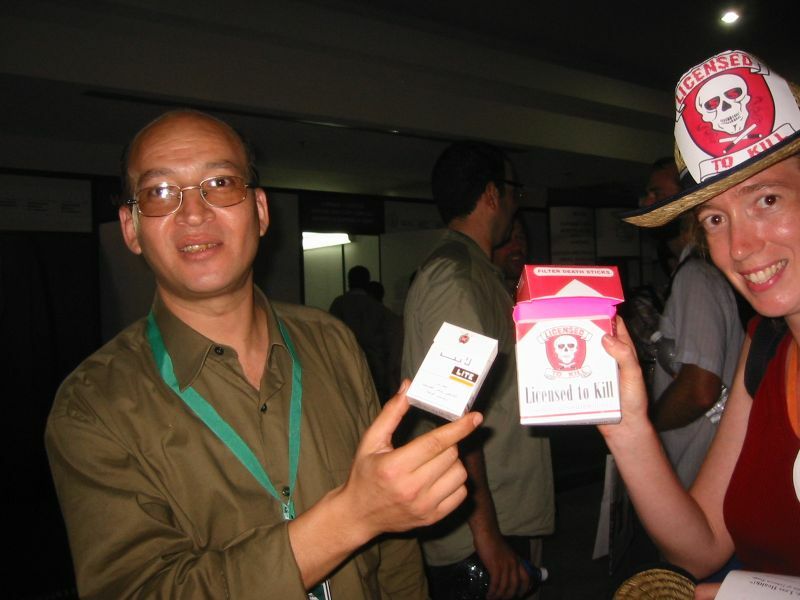 And an Egyptian media representative lamented that he was a smoker. 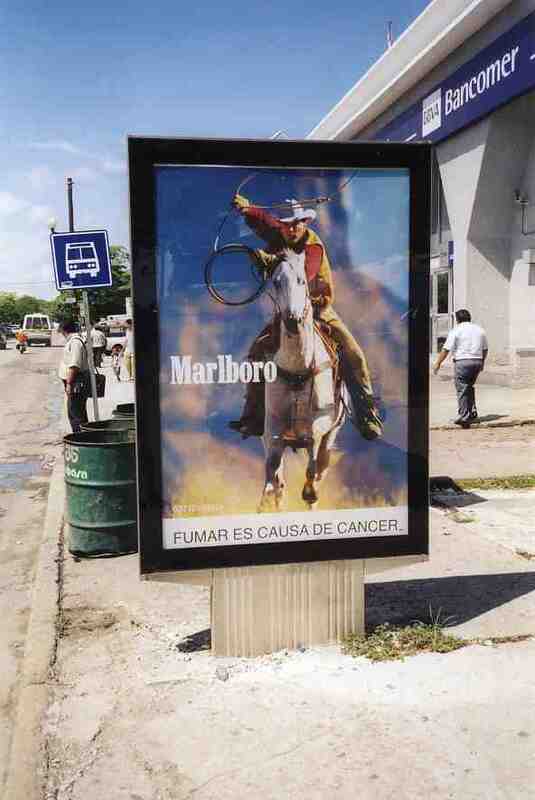 "Au contraire, the world needs more, not less, smokers," we told him, "you just need to switch to one of our brands!" 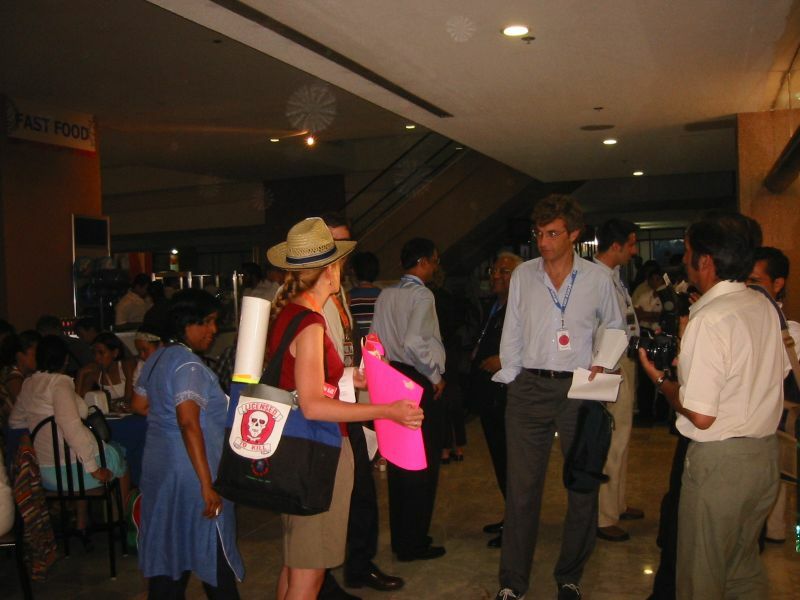 Many NGO representatives found us amusing and were more than happy to accept our literature. Guess they had never encountered a company that tells the truth before. 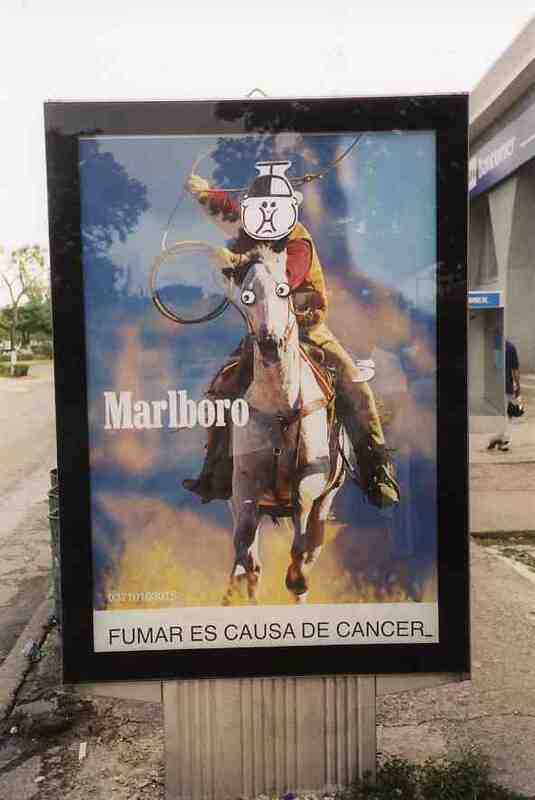 Others seemed less amused by our "Tobacco Over Health" message. 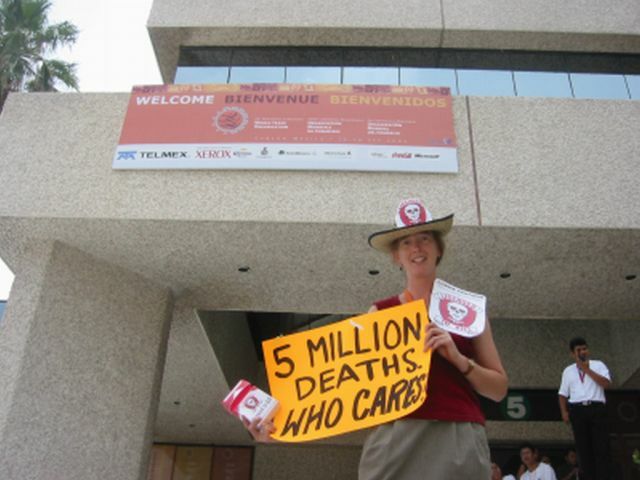 "5 Million Deaths - Who Cares?" 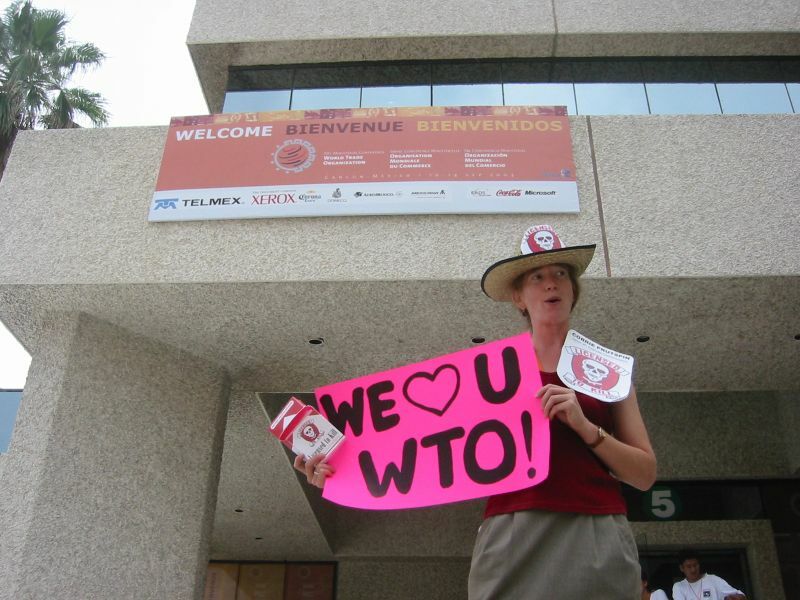 NOTE OF THANKS: To our delight, the WTO Convention Center was one big smokefest. 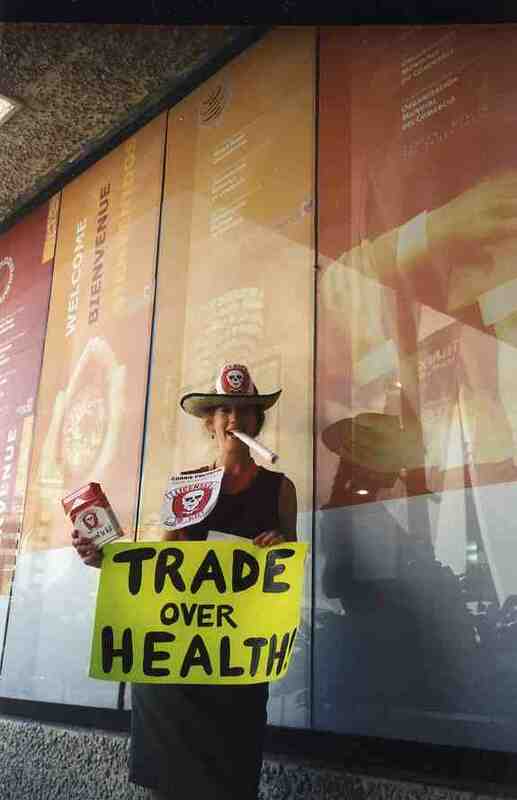 Some WTO delegates apologized for smoking around us, but we told them to keep on puffing away -- after all, the more they smoke, the richer we get! 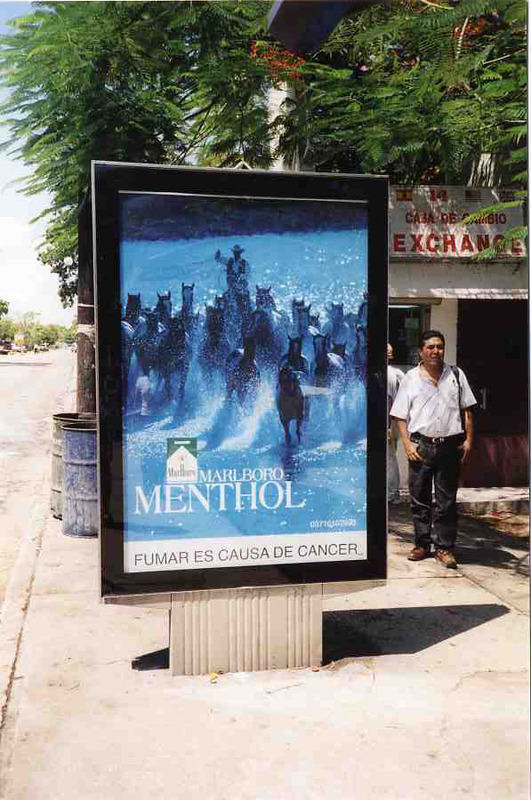 Our company's found it highly lucrative to maintain smokers' "freedom to poison the air." 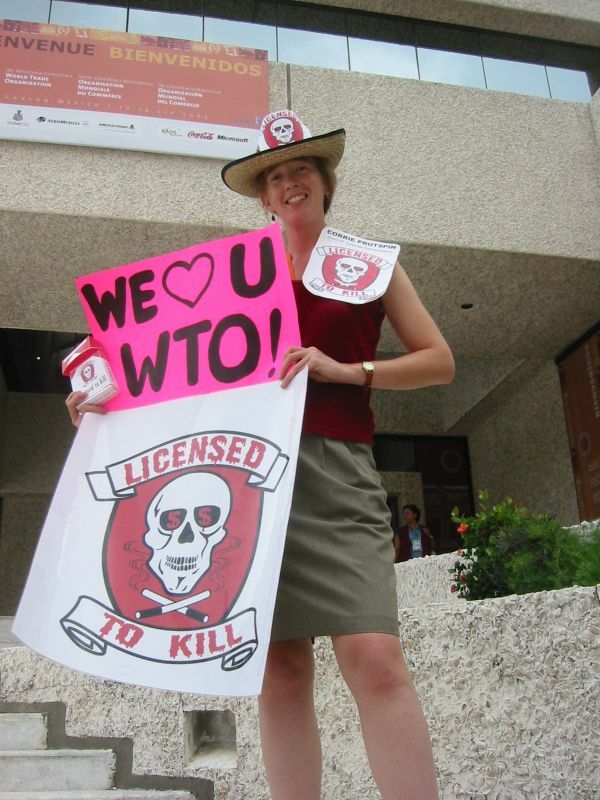 We would like to take this opportunity to thank the WTO for its poison-friendly conference venue policies. A few days later we passed by the latter and noticed that some crazy kid must have defaced it. In our view, such hooligans need to "get a job"! of the contents of www.licensedtokill.biz, as well as the behavior of our company and its public statements.